In September the Selection Committee of the Breakthrough Prize in Fundamental Physics announced a Special Breakthrough Prize in Fundamental Physics, recognizing British astrophysicist and honorary AAS member Jocelyn Bell Burnell for her discovery of pulsars and her inspiring scientific leadership over the last five decades. 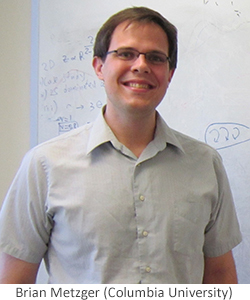 AAS member Brian Metzger (Columbia University) is receiving a New Horizons in Physics Prize "for pioneering predictions of the electromagnetic signal from a neutron star merger, and for leadership in the emerging field of multi-messenger astronomy." Rana Adhikari (Caltech), Lisa Barsotti (MIT), and Matthew Evans (MIT) will share another New Horizons in Physics Prize "for research on present and future ground-based detectors of gravitational waves." Daniel Harlow (MIT), Daniel L. Jafferis (Harvard University), and Aron Wall (Stanford University) will share a third New Horizons in Physics prize "for fundamental insights about quantum information, quantum field theory, and gravity." The 2019 Breakthrough Prize and New Horizons Prize recipients will be recognized at the Breakthrough Prize ceremony, or the "Oscars of Science," on Sunday, 4 November. The gala event, hosted by acclaimed actor, producer, and philanthropist Pierce Brosnan, will bring together luminaries of the science and tech communities with celebrities, athletes, and musicians, all attending with the common goal of celebrating science and scientific achievement. This year's ceremony will be broadcast live on National Geographic, YouTube, and Facebook Live from the NASA Ames Research Center in Mountain View, California. For more information about the Breakthrough Prizes and New Horizons Prizes, see the press release from the Breakthrough Prize Foundation, from which much of this post was adapted.